Now why on earth would you want to start tearing emissions controls off your bike? Well for one, if you have aftermarket exhaust, you will get a rather annoying (to some, cool to others) popping sound on deceleration. The other reason is that you hate the extra 0.872 lb. on your bike. Well, I won't go into that now. There's a third reason, too. It *could* make the bike run hotter due to the extra "combustion" taking place. I think that's near impossible because the combustion occurs in the header, but some believe they have positive proof that it runs cooler. As they say, YMMV. Happy wrenching! The Pulse secondary AIR injection system takes air from the airbox, via a vacuum-operated control valve, and injects it through the two PAIR check valves (located on each valve cover) into the hot exhaust gas. The oxygen in the air allows any unburnt fuel to ignite (which it will because it's still hot as hell). The control valve opens on deceleration, when vacuum is at its highest. The PAIR check valves are reed-type valves and only allow flow into the heads. There is a "reed stopper" which prevents the metal reed from opening too far and thus permanently bending. It's a relatively simple system. Remove the rubber hoses going to each PAIR valve. Remove the two bolts holding each PAIR valve in place. You will see a small screw holding the reed stopper and reed in place. Remove the screw, flip the reed stopper to hold the reed shut, and replace the screw..
Now, if you're one of those guys/gals who is happy being fat (me), and really doesn't care to diet (me), but still wants to lose every .05 ounces of weight off the bike because it'll make you .00001 seconds quicker in the quarter mile, but you can still feel the increased acceleration by the "seat of the pants", plus it makes the bike handle sooooo much better (not me, but I did it anyway ), follow the next few steps to remove the rest of the PAIR plumbing. Go to auto parts store and buy an assortment of small rubber vacuum caps and the larger ~3/4" dia. "coolant block-off caps". I found mine at Advance. Remove the seat and tank. Remove the airbox cover and airbox lower. Note that you must remove the air funnels. The longer one is on the rear. Disconnect all the hoses one by one that attach to the airbox, engine, and carbs. Replace each one with an appropriately sized rubber cap as you go. IIRC, there is one screw holding the control valve to the airbox. Yank the whole thing as one assembly. You will now be able to go faster and lean further than ever before now that all that excess weight is gone! I hope this has been helpful and informative to all those do-it-yourselfers out there. Oh yeah, I take no responsibility whatsoever if you screw this up or drop little screws into your carb throats. [*]You will see a small screw holding the reed stopper and reed in place. Remove the screw, flip the reed stopper to hold the reed shut, and replace the screw.. This step is holding me up. Do you really have a screw, or is it a little nut? I ride an '05, so I wonder if mine could be different. I've got this 6- or 8-mm nut, that is surrounded by what I assume is the reed stopper (black, plastic-y..), with the reed in the middle recessed 3/16" or so. I'm glad I was gentle with the reed, because it was fairly flimsy. Anyway, is this an '05 thing, or am I taking off the wrong cover (took off the rear one too; same image), or would you have other insight to offer? Note: when I wrote "surrounded by.. ..reed stopper," it's because there is no room for the nut to turn because of the cover (reed stopper) completely surrounding the nut; i.e. I doubt I could apply enough force to turn the nut now, much less grind through the cover. .. I took a picture.. Yes! That is exactly what I needed. I didn't realize the PAIR valve was completely surrounded by the rubber gasket, and had to be pulled out somehow. I was confused when the rubber wouldn't pull off. I didn't want to rip it. Anyway, I ended up sticking a utensil in the reed hole to pry the valve off. Super easy; go figure. Thanks again, Greg! Thanks for great infos I just disable my PAIR and clean up all those extra tee hoses. And I did order a pair TPO block off kit. So Scooberhawk, how much of a difference did it make, sound-wise? I disabled my PAIR at the same time I put on my exhaust, so I have no reference for sound. It doesn't pop on decel, though.. well, hardly ever. Will this help with the annoying squeek sound when the bike is idling? There were pictures there before, but I think the servers went down sometime last year and alot of the photos were lost. Does the little hose that connects to the PAIR valve from the carbs have to be plugged? RIP Zy! You will always be in our hearts. Only nice thing about having my bike in pieces...is that I've been able to take the time to work on it like I've never worked on it before. I disabled my PAIR valves about 10 minutes ago. Thanks for the picture Greg, that was very helpful. Removed the PAIR valve/hoses today while I was in rejetting for my jardines and bmc filter. No more popping on decel and it pulls the front end nicely now and I didn't even use a jet kit! Thanks for the pics and info Greg. Flipped my PAIR Reeds, removed all the Restrictive equipment and it seems to have freed up some HP! Seriously wheelied a bit taking off from a light....roll on while shifting to 2nd! I flipped my PAIR reeds today, did the Bafflectomy yesterday, I just need to take her for a ride and feel if there's a difference. I left all the unneeded plumbing still in tact, Ill remove that stuff after I pick up some vacume caps. Finally got out for a test ride. I could be imagining it, but I really felt like it has a little more in the mid now. Its quite a bit louder than my stock exhaust was with 8 - 1/2" holes drilled around the baffle. If you dont mind the bike being loud(think Two Bros) than the bafflectomy is worth the trouble. As for the PAIR mod, im not sure that I notice any difference yet. It doesn't pop on decel, though it didnt pop much to begin with. Preventing fresh air from being added to the exhaust gas will have absolutely no effect on power output. It's in all in your head. The PAIR simply burns hydrocarbons in the exhaust, outside the cylinder. Im certain that the PAIR blockoff didnt gain me any performance. Im thinking that the baffle removal might have helped free up the engine some. Again, it may just be in my head, or it could be the louder exhaust, but it felt stronger in the mid. if you do the whole yank everything out and use vac caps, do you still have to pull the reeds and flip the stopper over? Hey guys , just for a point of information after variuos conversations i,ve found out our Kiwi and Aussie spec bikes dont have a pair system at all , thats different aye. ????? Won't reversing the valve give an opportunity for exhaust gases to back up into the PAIR valve equip? Just checking, but is that possible and could that cause damage to the PAIR equip? 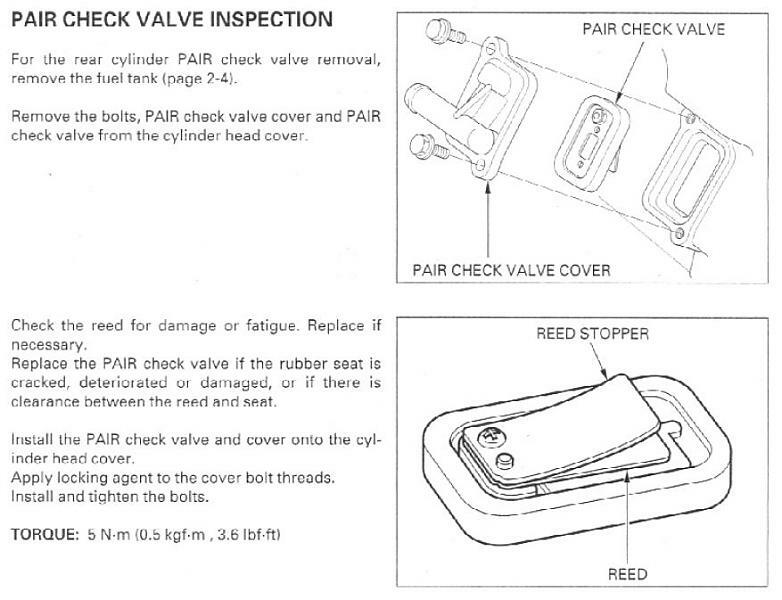 nope, the reed valve will be pressing closed when normally it tends twords open (with vacuum causing it to open) so it is less likely to allow exhaust gasses back into the intake than in stock form. Just pull the reeds out, put a little RTV on the gasket and bolt it back up. Make sure to cap both PAIRs and the hose coming off the carb. Sync the carbs and away you go. but I love the popping! I really like the popping too! I ordered some vacuum caps from Amazon - we'll see. This may be a silly question but... Do Australian hawks have the pair system installed?